I've been neglecting this blog, but these last couple of weeks have been busy. And I got sick somewhere in there. Not fun. But I should be able to take comfort from the fact that Josh Groban was sick at the same time. Anyway, I'd like to compare two characters today: Mr. Rochester from Jane Eyre (where else?) and Henry Higgins from George Bernard Shaw's play Pygmalion. If you're familiar with these two, that probably sounds pretty drastic, but just hear my argument first. Last spring (almost exactly a year ago), I saw a great version of this play in Mesa by the Southwest Shakespeare Company, starring Broadway actor David Adkins as Henry Higgins. I thought it was hilarious, so I had to go see it a second time, which happened to be its last performance. For those of you who aren't familiar with it, it's based on the myth of a sculptor who falls in love with his statue of his ideal woman. In the play, Higgins is a professor of phonetics who teaches Eliza Dolittle, a London flower girl, to speak with a proper accent. At times, it seems like they're going to end up together, but they actually don't for character reasons. Now, both Rochester and Higgins have changeable natures. They're often curt in speech, jumping quickly from one attitude to another. Rochester studiously examines Jane's paintings before abruptly ordering them away; Higgins excitedly tells Pickering about recording his visitor's speech until he sees that it's Eliza and grumpily sends her away. Higgins is more easily likeable, though, because it's so easy to just laugh at his antics, whereas Rochester is a darker character. Both of them are overbearing towards Jane and Eliza. They order them about and treat their feelings rather harshly. But Jane welcomes the attention, Rochester's strength, and the chance to help someone improve himself. Eliza is too strong a character to bend underneath Higgins, who is himself too complete in himself to ease up enough to keep her. Keep the two main points of "the Rochester character" in mind. Changeable and controlling. I'll probably refer to this more, especially when I bring in another couple characters. Movie-making is an amazing process, so I try and get movie companions (not the visual guides with just pictures and plot summaries) and such whenever they're available for movies I see. Which isn't too often: I don't always watch the more popular movies. I was kind of disappointed with Twilight's movie companion. It was too ordinary, not enough inside info. So I was hoping that the Director's Notebook would fill in with what I was missing. It did. When I opened the book and saw that it's all handwritten, I had my doubts. But as I started reading, I couldn't stop. It really is just like a notebook, handwriting aside. It has little details and tidbits of stories along with pictures, concept art, and storyboarding. 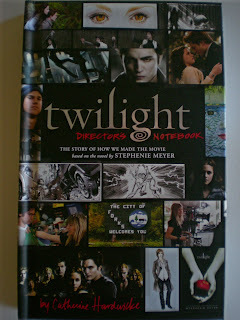 A few of the pictures are also in the movie companion, but Catherine Hardwicke scribbled words on them, giving another perspective. It's a pretty short book (even the slooooow reader that I am, I was able to finish it in less than five hours), but I'm very glad I got it. It has the personal, yet technical touch movie-making books should all have. So long as I'm talking about Charlotte, here's a wonderful quote of hers, taken from Jane Eyre. Jane is comparing the opposite extremes of her cousins' characters. She says, "Feeling without judgement is a washy draught indeed; but judgement untempered by feeling is too bitter and husky a morsel for human deglutition." I have to agree entirely with her. You can't let your emotions spin you out of control, but you can't deny them, either. Personally, I think that emotions can be logical; you can have them both in perfect symbiosis. It's like how you feel guilt when you've done something wrong. That's a logical thing to feel, and since you knew beforehand that the action could make you feel guilty, you could've chosen (logically) not to do it to avoid the feeling. So the two kind of work hand in hand. Why Did They Get Rid of These? 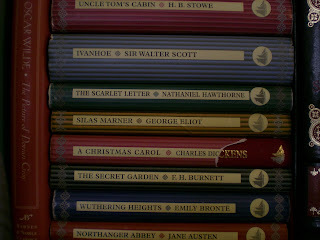 I loved this range of classics that Barnes and Noble used to have. They were all about six by four inches and five dollars each. Hardcover, gold-edged, and clothbound, too. Perfect for me because they didn't have pictures on the cover (I don't know why that often bothers me) and were small enough to fit in a purse. I was only able to get eight before they stopped making them a couple years ago. Now they still have good-priced classics, in hardcover and paperback, but they're just not the same. They're bigger. I don't like books to be big. Though the pages do have a little more space for scribbling. I tend to do some informal annotating on the classics to make sure I'm not missing things. So I guess that's nice, but still. To answer my question, though, I think it's because most people aren't like me. They don't want small books. The old ones were tiny. Most people would probably pass them by, thinking they were abridged or something. I'm going to try out doing a "Word of the week," but it'll probably end up being every two weeks. "Word of the Fortnight" would just sound too weird, though, so I'll still be labeling it that way. Webster's says: delirious - 1. affected with or characteristic of delirium. 2. wild with excitement, enthusiasm, etc. I just had to add "delirium" in there, also, because I prefer "violent" to "wild." I think of "delirious" as fey and half-crazed. Hence the name of my blog. It's supposed to be as utterly random and delirious as my plain thoughts can be. Delirous is, to me, the point where "crazy" is a cool thing. Chocablog is an international site (based out of the UK) devoted to chocolate. I have the privilege of being their only U.S. staff member. There are also two British reviewers and two Australians. I've only been with them since June, but the site itself turns three years old today. So take a look at what we're up to. We've been making expanding a lot lately, even getting our own discussion forum. In celebration of this, here's an idea I've been turning around in my head for a little while. 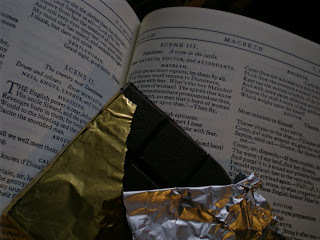 The connection between books and chocolate. There are some (think Milky Way and Janette Oke) that hold your interest for the moment and require little from you, but don't leave the greatest impression. Others you like a little more and can't help but adore at times, but still can't call too great. For me, that's KitKat and Twilight. Then you start moving up. These ask for some commitment. Amazing chocolatiers like Pralus, Michel Cluizel, Amano, and Patric Chocolates are comparable to the classics. Little more dense, little more intimidating, but so rewarding once you get past that. With so many things, like music and books, the way you're introduced to something can mean so much about how well you like it. If you hear some piano music on an upbeat day, you might not really like it; if you hear rock on a mellow day, the same thing could happen. That's why I have trouble putting my iPod on shuffle. Depending on the mood I'm in, I won't necessarily want to hear everything that comes up. It's also an outward thing, not just inward. Back when I was first introduced to Hamlet, the teacher relied more on the movie version with Mel Gibson. We didn't even read the whole play. Now, I'm no big fan of the crudeness in Shakespeare, and the movie really plays up that part, so I didn't enjoy it. Just the opposite. I'm reading the play again for class and, though it's still not my favorite, some of it's interesting this time around. All the double meanings keep your mind constantly at work. Minus the odd teaching style, I'm able to appreciate it now.